The St. Louis region’s central position was well documented in a recent report by the Corps of Engineers. Comparing the Port of Metropolitan St. Louis, a 70-mile system that includes nearby regional ports, the Corps ranked St. Louis regional ports as the most efficient inland port district in terms of tons moved per river mile during 2015, the most recent year for which final numbers were available. The St. Louis region’s barge industry handled 500,000 tons per mile. Its closest competitors, the Port of Huntington-Tri-State in West Virginia and Ports of Cincinnati-Northern Kentucky, ranked second and third respectively, moving more than 200,000 tons per river mile, making the St. Louis region 2-1/2 times more efficient with its river usage than its closest competitors. To put it another way, the St. Louis region’s ports and river terminals captured one-third of all freight traffic along the section of the Mississippi River from Minneapolis, Minn., to the Ohio River near Cairo, Ill. The 70-mile St. Louis regional port system represents 8 percent of this 855-mile section of the river, yet carried one-third of the total 2015 freight. Its mix of grain-handling and logistics assets on the Mississippi River is now so concentrated that it has no real rivals in the U.S.; its only peer competitors are a few other regions elsewhere in the globe, in Brazil and the Black Sea coast. These developments were the focus of a special October 6 presentation ahead of the annual meeting of the Bi-State Development Agency, an economic development organization established by Congress in 1949. The presentation was hosted by St. Louis Regional Freightway, the bi-state area’s enterprise responsible for maximizing infrastructure investment through public-private partnerships to optimize the region’s freight transportation network. Freightway’s executive director, Mary Lamie, hosted a talk with Dave Jump, a prominent grain trader, and then a panel discussion on Jump’ observations. As the owner and CEO of American Milling, a grain processor located in Cahokia, Ill., Jump has more than 30 years of experience in handling grain along the Illinois and Mississippi rivers. Among his holdings are grain terminals on the Mississippi and Illinois rivers that handle barge, rail and truck. Jump gave a similar talk to a Freightways meeting in August. The region’s growth and consolidation have come from a convergence of public and private investments in infrastructure. Driving this investment has been a steady growth in world demand for grain, oilseeds and meat, especially from China and Asia. Since 2005, private companies in the St. Louis region have invested more than $200 million in agricultural product barge transfer facilities. 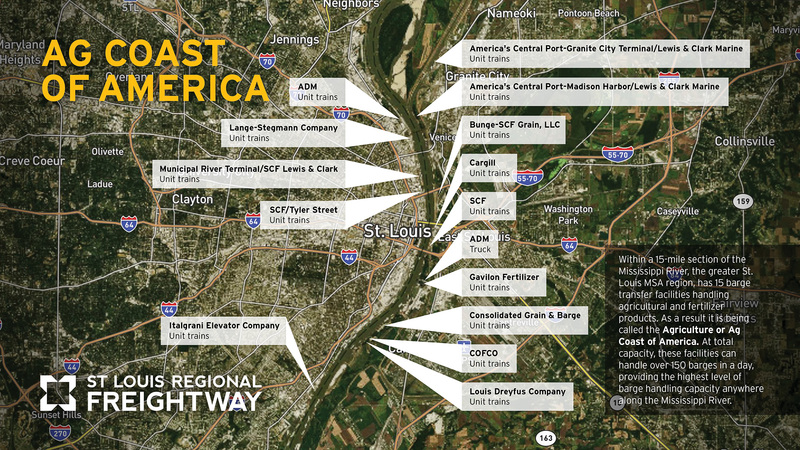 Map shows major grain facilities in St. Louis region. Within a 15-mile stretch, the Missouri side boasts facilities operated by ADM; Lange-Stegmann; the St. Louis Municipal River Terminal, operated by SCF Lewis & Clark; another SCF facility at Tyler Street; and an Italgrani U.S.A. facility on St. Louis’ south riverfront. Italgrani, one of the country’s largest millers of durum wheat, bought a grain elevator at its Van Buren Street facility in 1980 and eventually moved its U.S. headquarters there. In August, Italgrani announced it was investing a further $37 million in its St. Louis operations. It plans to add more storage bins and a new mill that will increase capacity by 40 percent. The expansion projects should be completed by the third quarter of 2018, the company said. The Illinois side of the Mississippi River, extending from America’s Central Port in Granite City, Ill., boasts two more Lewis & Clark terminals, and facilities owned by Bunge-SCF Grain LLC; Cargill; ADM; Gavilon Fertilizer; Consolidated Grain & Barge; and Louis Dreyfus Company. The China National Cereals, Oils & Foodstuffs Corporation (COFCO), a grain company owned by the Chinese government, announced August 18 that it has created a new grain partnership with Growmark Inc. that includes joint ownership and operation of the barge, truck, and rail terminal at Cahokia, Ill., with frontage on the Mississippi River, as well as a grain origination agreement (WJ, August 28). All of these facilities on both sides of the river can handle unit trains, except three: St. Louis Municipal River Terminal, Cargill, and ADM in Illinois. Unit trains are made up of 110 to 125 dedicated grain cars and three or four locomotives that stay together as they travel back and forth instead of being disassembled, said Jump. Keeping those railcars together and loading and unloading them quickly is necessary to efficiency and profits. Many St. Louis facilities also have high-speed 60-inch conveyor belts and unloaders that can move product at high speeds. In fact, Jump’s own company, American Milling, “just poured concrete” October 6 on a new facility located immediately downstream of the Louis Dreyfus facility on its property in Cahokia. Two 60-inch-wide conveyor belts will transfer grain and grain products to two new barge loading docks. Jump explained that while not all the capacity may be engaged all the time, excess capacity is important because grain shipments come in waves. Since 2010, according to published information from the Illinois and Missouri Departments of Transportation, close to $1 billion has been invested in the region’s interstates and bridges. That includes the new Stan Musial Veterans Memorial Bridge connecting Missouri and Illinois via Interstate 70, which helps to improve truck logistics and relieve congestion across the city’s other eight bridges. A top transportation priority for the region—and for the barge industry as well, said Lamie—is the urgent replacement of the Merchants Bridge and the upgrading of the MacArthur Bridge, two of nine river bridges in St. Louis. Both the Merchants and MacArthur bridges are privately owned by Terminal Railroad Association of St. Louis. Despite Merchants having been originally built in 1889 and MacArthur in 1917, they are the two most heavily trafficked of all rail bridges across the Mississippi River. But weight restrictions are limiting their usefulness. Merchants is double-tracked, but is restricted to one train at a time. The MacArthur originally carried both cars and rail, but now carries only rail traffic. Jump said that improvements in crop yields, fueled by developments in crop genetics by companies like St. Louis-based Monsanto Corporation, have contributed to a series of record harvests in corn and soybeans. The top five corn and top five soybean crops ever in the United States have all been recorded within the past five years, he said. The records were not always “stair-step” increases; this year’s corn record will not top last year’s. But this year’s U.S. soybean crop promises to be the largest ever. While part of the growth of corn has been driven by domestic demand for corn ethanol, that demand has largely been met. Soybean exports are the “rock star” of U.S. agriculture exports. Twenty years ago, 1 percent of the U.S. soybean crop went to China; today, it’s about 30 percent. Of this year’s U.S. soybean crop of over 4 billion bushels, half will be exported, and as much as 70 percent of that half will go to China, said Jump. In a case of “winner take all” or the big getting bigger, all that concentration of grain-handling capacity in St. Louis has contributed to a significant cost advantage. “Volume begets more volume,” said Jump. Barge lines like loading in St. Louis, and their efficiencies are helping to increase price spreads between St. Louis and its competitor ports further north. About 15 years ago, a grain shipper in Illinois looking to move a ton of grain to a river port for shipment south to New Orleans could choose to truck it to Peoria on the Illinois River, where loading it into barges might have then provided a barge freight differential of about $1 to $1.50 more per ton than St. Louis. Today that differential is about $6 or $7 per ton, enough to shift cargoes and routes. While the absolute numbers of cargoes handled in Peoria have not declined, said Jump, its percentages are down. “The price spreads between Upper and Lower Mississippi River ports are being set by the economics of barge lines,” said Jump. Another contributing factor to the price spread, Jump added during a question period, is the perceived risk of delays from the aging lock system north of St. Louis. St. Louis is the northernmost lock-free port. But if river ports like Peoria see absolute export numbers going up or holding steady while market percentages go down, that is true of U.S. grain exports as a whole as well. Burke said that the U.S.’s top grain export competitors have been building out their infrastructure and improving their competitiveness, especially northern Brazil and the Black Sea region comprised mostly of Ukrainian and Russian shipments. Brazil’s infrastructure improvements, in particular, are chipping away at the “transportation advantage” that reduced the transportation cost of U.S. corn and soybeans on the world market even though their cost of production is higher than Brazil’s. The desire by the Chinese government to more closely control all stages of the grain supply chain led to the decision of COFCO to buy its Cahokia facility in 2016. Jump noted that China buys grain from the U.S. and its competitors. “We’re not ‘special,’ but the demand from China is so great that it’s almost insatiable,” he said. That demand will continue to grow. 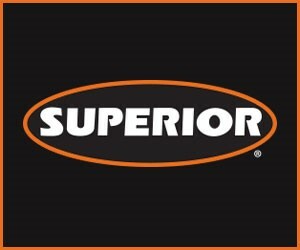 Riverport Plans Deferred In Lincoln County, Mo.